In the UK, they are referred to as mature students. In the US, they are the so-called nontraditional students, i.e., anyone who waits for more than a few years out of high school to enter college for the first time. The experts fret: Will they remember how to study? Will they fit in socially? Will they be able to compete academically? UF senior Derek Klein is, by definition, a nontraditional student, having started college at age 27, and he’s doing just fine, thank you. Derek grew up in the suburban Kendall area, between Homestead and Miami. High school and he did not suit each other very well. His grades were mediocre at best and nothing much in the curriculum inspired his interest. At graduation, his first priority was to put bread on the table, so he became an electrician’s apprentice, then eventually transitioned into security technology, i.e., access control systems, cameras, fire and burglar alarms. Before long he was a Lead Service Technician doing troubleshooting for power companies and various banks up and down the Gold Coast. As you can imagine, getting stuck in traffic was an everyday occurrence, so to pass the time Derek would listen to podcasts on his new favorite subject, astronomy. After the 300th episode, he decided that studying astronomy in college would be more interesting than being stuck in traffic for the rest of his life. He kept his job but moved up the coast to Melbourne and started at Eastern Florida State College (formerly Brevard Community College). By taking most of his classes online, he was still able to work three days a week and get paid for a fourth with his accrued vacation time. Because nine years had passed since high school, he started with the basics, like algebra, and worked up from that to calculus and physics. While taking an astronomy class, the professor advised him to get his undergraduate degree in physics as a solid basis for any subsequent career in astronomy or astrophysics. By the time he received his Associate of Arts degree from Eastern Florida, Derek was getting straight A’s. The spring of 2016 found Derek as a new transfer student at the University of Florida, planning to double major in physics and astrophysics. Why the University of Florida? Well, Derek is also a major aficionado of parkour, a training discipline similar to a military obstacle course, where you jump, vault, and dive around objects in your environment to get from point A to point B. Derek was co-founder of the Miami Parkour and Florida Parkour groups. 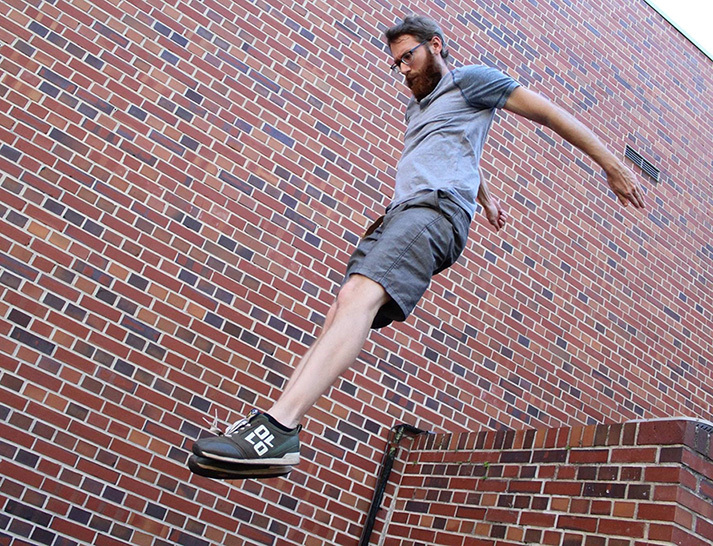 Every Earth Day, there is a big parkour “jam” in Gainesville, mostly on the grounds of the university campus. For years before starting college, Derek had been coming to UF for the jams. He had fallen in love with the campus and city, and now he could pursue his academic dreams there, too. Another function of SPS is outreach, where Derek has also played an important part. 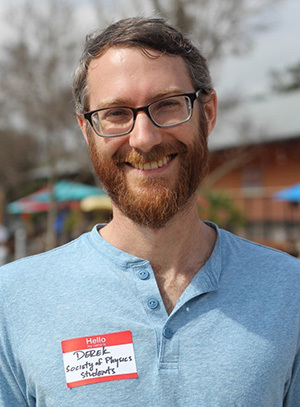 At the suggestion of physics Professor Peter Hirschfeld, SPS, under Derek’s leadership, organized a “Women and Girls in Science Day Fair” at Depot Park in downtown Gainesville. Seven UF STEM clubs participated in this event, which celebrated the UN’s Women and Girls in Science Day. It attracted over 300 local kids and their parents for a day of science demonstrations, mini-talks, and meet-and-greets with women scientists, mathematicians, and engineers. So with graduation impending, what’s the next step in Derek’s quest to fulfill his dreams? Says he: “If I was guaranteed of getting an Astronomy PhD in four years, I'd do it in a heartbeat. But at my age (31), I can’t risk being in school for another six or seven years.” His solution is to go for a master’s degree in Aerospace Engineering, a program to which he has been accepted at UF. In two or three years, he hopes to be employed in the business of designing scientific instrumentation to be flown on satellites and deep space missions, such as those used in the European Space Agency’s Laser Interferometer Space Antenna (LISA). For Derek, where there’s a will, there’s a way. And he’s certainly come a long way from sitting in traffic.